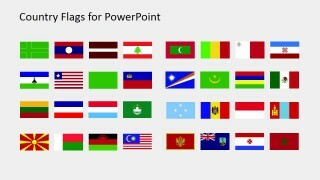 The Country Flags Clipart for PowerPoint (L to M) is a brilliant template with the collection of country flags. 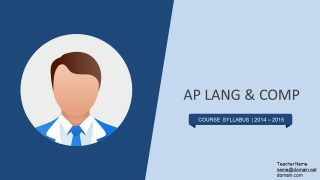 It is a multipurpose PowerPoint, useful in business slides, tourism, and global marketing etc. 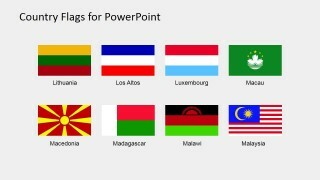 This template has flags of countries starting with the alphabets L and M. PowerPoint consist of 32 country flag clip arts further segmented into 8 shapes per slide. The slidemodel offers more country flag clipart templates against every alphabet. 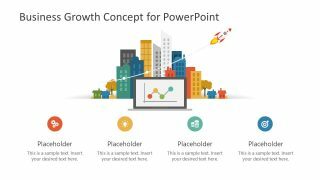 Moreover, the PowerPoint shapes are high-resolution flat vector graphics. 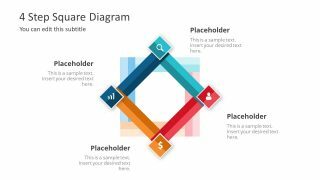 It makes it quite easier for the users to customize the template to any shape and size. For instance, making a button shape of flag using the round crop option in picture format menu. 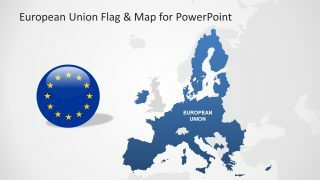 Or, increase and decrease the size of the flag according to the presentation requirement. 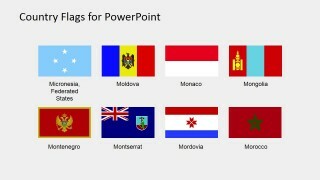 The Country Flags Clipart for PowerPoint (L to M) is an aid for the templates which require country representation. There are unlimited uses of this template for marketing purposes. Because these icons are the visual representation of a country, an audience can quickly understand the concept. For example, the tourism, statistical analysis of various countries, sports, competitions, and international business opportunities etc. The use of national flags looks fantastic in the international corporate meetings. Nevertheless, it is the symbol of patriotism which wins people’s heart. Similarly, in the field of education, the presentation of flags can assist pupils to recognize each flag and respective country. 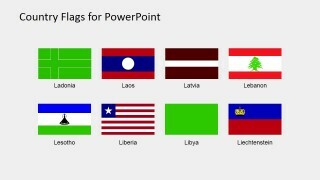 The (L to M) PowerPoint presentation of country flags include: Ladonia, Laos, Latvia, Lebanon, Lesotho, Liberia, Libya, Liechtenstein, Lithuania, Los Altos, Luxembourg, Macau, Macedonia, Madagascar, Malawi, Malaysia, Maldives, Mali, Malta, Mari El, Marshall Islands, Mauritania, Mauritius, Mexico, Micronesia Federated States, Moldova, Monaco, Mongolia, Montenegro, Montserrat, Mordovia, Morocco. The SlideModel also has a vast collection of editable country maps. 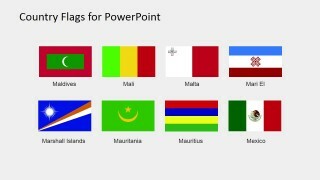 These maps and flags together id in creating professional PowerPoint Presentations. 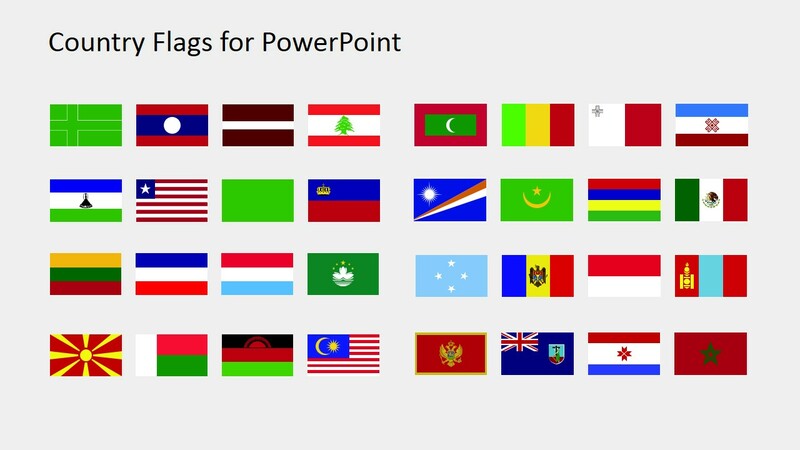 Also, insert these country flags clipart into any presentation which will emphasize on concept geographically. Furthermore, these are the value-added PowerPoint shapes to promote the company in an international market.